Well, Labor Day is here and, supposedly, so was Gustav the hurricane. We spent the weekend in San Antonio and ate a lot of heavy meaty foods like barbeque (chicken, brisket and sausage) and tacos (in all shapes and forms from lengua to chorizo and egg to awesome gelatinous spicy Chicharron). So, come Monday I was craving something lighter and with a hurricane in the gulf I figured lighting up the grill was not a good idea. Turns out Gustav did not affect Houston much, not even with a drop of rain. In any case these slow cooked beans still made a perfect dinner. I cooked the beans slowly for a long time in my black clay pot while we spent the day in the backyard cleaning up the garden and doing other chores. When the beans were soft, I cooked onions and bell peppers in olive oil on gentle heat. I added some minced garlic and white wine (I had some in the fridge that needed using up). 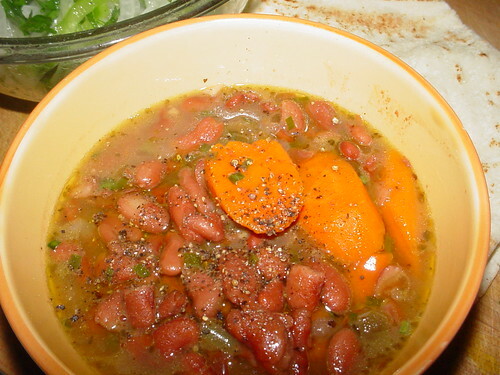 To bulk up the beans, I also peeled and sliced a few carrots and tossed them with the onions before dumping the whole flavorful mixture into the beans. I let it cook some more and seasoned it with salt and pepper and a good dose of chives. The beans were excellent served with plain rice, but the star of the dinner was the onion salad I made to go with the. Yes, onion salad. It was delicious, crispy and refreshing. 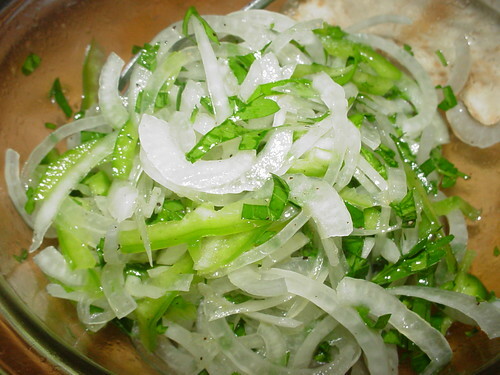 To make an outstanding onion salad without the pungency (and bad breath) first slice the onions as thinly as possible. Then soak the onions in a bowl of water and ice and leave it in the fridge for an hour or two. This step is essential. It will make the pungent onions crispy and amazingly mild. When ready to toss the salad, drain the onions well and mix them with a thinly sliced bell pepper lemon juice, olive oil, salt, pepper and a handful of chopped parsley. This salad is so good I can eat it by itself wrapped in pita bread or even better with some freshly fried potatoes.